Playdough is one of our very favorite materials for sensory play. It's inexpensive, it lasts for many months, it requires very little set up or clean up, and it's just plain fun! Yesterday I shared our Christmas playdough recipe. Today I pulled out the pine scented green dough and set up a simple invitation to play. It was a rainy day, so making playdough Christmas trees seemed like the perfect indoor activity to keep little hands busy for quite awhile. The sparkly pipe cleaners and jingle bells were provided to me free from craftprojectideas.com. I have these collage caddies from Lakeshore Learning. Muffin tins would also work well. I filled one for each of my four boys, so they could work independently, although Tank (2) and JZ (6) shared a chair and a caddie. It was quite adorable. I divided our green playdough in four and rolled each portion into a ball, and the boys jumped right in and started playing. J-Bug (4) immediately rolled out his dough and began making playdough Christmas trees and other cookie cutter shapes to decorate. One of the cookie cutters I set out was in the shape of a leaf. Tank fully embraced the fine motor aspect of playing with playdough. He was enthralled with the sparkly pipe cleaners. He used the scissors from our playdough kit to pull the pipe cleaners out of the dough. J-Bug also loved the pipe cleaners, and he meticulously placed them in his cut outs and topped them with a bit of glitter. Our table looked something like this by the time we were done creating. Yes it was messy, but not too bad for over an hour of play on a rainy day. Since the Christmas season has only begun I sorted the elements, with the exception of the glitter and sequins, and left them in the caddies to use another day. I imagine our Christmas playdough accessories will get quite a bit of use this month. Don't let the use of glitter concern you. Glitter and playdough go very well together. When we were done playing I simply pressed the playdough onto the piles of glitter, and the glitter stuck easily to the dough. 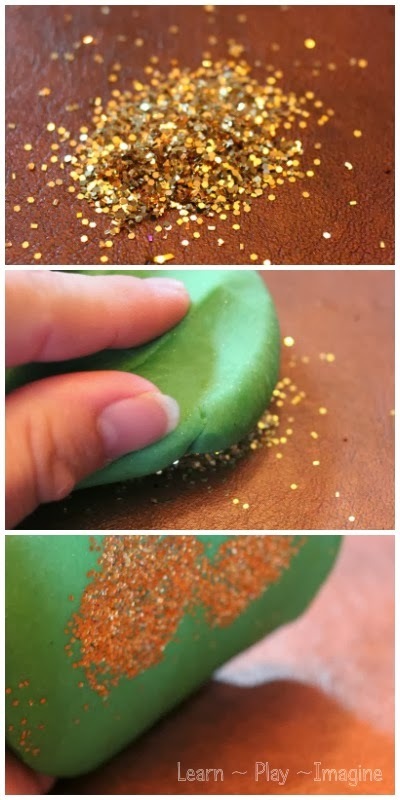 To pick of small bits of glitter I rolled the playdough out like snakes. Our Christmas playdough had a bit of shimmer to it already, and now it is gorgeous and sparkly. My table is clean, and whatever stray bits of glitter fell to the floor will vacuum up the next time I vacuum the dining room. 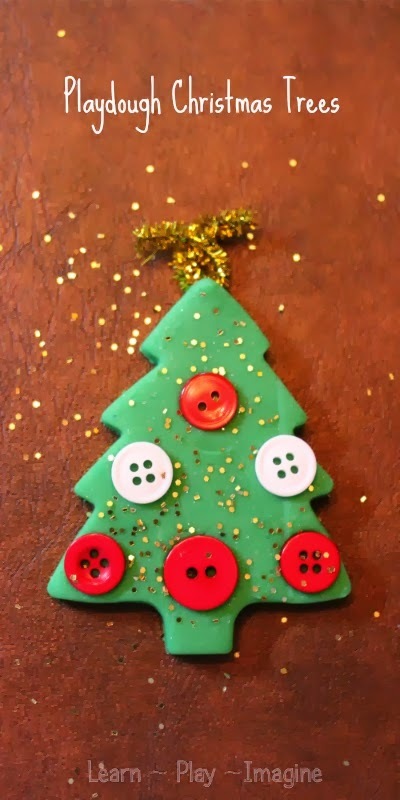 For more Christmas sensory play ideas and other playdough activities follow me on Pinterest. Did you have to bake the ornaments after you made them? I'm sorry, these are not ornaments. It's just a fun playdough activity.